This article is about the mathematician. For the British World War II internee, see Ben Greene. For those of a similar name, see Benjamin Green (disambiguation). Ben Joseph Green FRS (born 27 February 1977) is a British mathematician, specializing in combinatorics and number theory. 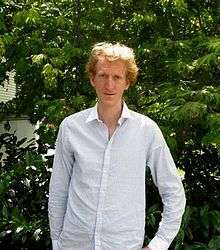 He is the Waynflete Professor of Pure Mathematics at the University of Oxford. Ben Green was born on 27 February 1977 in Bristol, England. He studied at local schools in Bristol, Bishop Road Primary School and Fairfield Grammar School, competing in the International Mathematical Olympiad in 1994 and 1995. He entered Trinity College, University of Cambridge in 1995 and completed his B.A. in mathematics in 1998, winning the Senior Wrangler title. He earned his doctorate under English mathematician Timothy Gowers in 2003, with a thesis entitled Topics in arithmetic combinatorics. He was a research Fellow at Trinity College, Cambridge between 2001 and 2005, before becoming a Professor of Mathematics at the University of Bristol from January 2005 to September 2006 and then the first Herchel Smith Professor of Pure Mathematics at the University of Cambridge from September 2006 to August 2013. He became the Waynflete Professor of Pure Mathematics at the University of Oxford on 1 Aug 2013. He was also a Research Fellow of the Clay Mathematics Institute and held various positions at institutes such as Princeton University, University of British Columbia, and Massachusetts Institute of Technology. Green has published several results in both combinatorics and number theory. These include improving the estimate by Jean Bourgain of the size of arithmetic progressions in sumsets, as well as a proof of the Cameron–Erdős conjecture on sum-free sets of natural numbers. His work in demonstrating that every set of primes of positive relative upper density contains an arithmetic progression of length three then led to his 2004 work with mathematician Terence Tao now known as the Green–Tao theorem. This theorem showed that for all n there exist arithmetic progressions of length n in the prime numbers. Green received the Clay Research Award in 2004 and the Salem Prize in 2005 for his contributions to combinatorial number theory related to progressions of primes. In 2005, he was awarded the Whitehead Prize, an annual award for British mathematicians in the early stage of their career. In 2007 he was awarded the SASTRA Ramanujan Prize. In 2008 he was among the ten recipients of the European Mathematical Society prize. In 2013, he was awarded a Gauss Lecture by the German Mathematical Society. ↑ "Ben Green's results". International Mathematical Olympiad.